It’s easy to forget how fortunate readers are to live in an age when ease of travel gives us unprecedented access to authors. If you live somewhat near a big city in the US, the chances are that some authors of interest are going to show up in bookstores in your neighborhood. It all seems so easy. Of course, scheduling this sort of thing is not so easy, which is something I’ve learned as I try to take my radio show on the road. My thought is that this is sort of like being in a rock band. You want to get live exposure, and you sign up the acts. But getting everybody to the store on the date proves to be easier said than done. For the January 8 segment of The Agony Column Live, I had everything planned out … until the plans came undone. Lisa Desrochers was still driving down to Capitola, and it was a hell of a drive, from Oakdale. But my other guest proved to be unable to make it, and I didn’t get wind of this until the last moment. Fortunately for me, I live in a place with some of the world’s greatest writers — one of them, of course, being Karen Joy Fowler. She’d planned to come to the gig anyway — and since she had cleared the time, she didn’t mind being part of the party. We began with the readings, which the writers kept shortish and to the point, but each gave us a real flavor of what they wrote. But the real fun came when I started asking questions and, quite happily, got answers that were not what I expected. Now, the Interviewer Rulebook tends to say that you should never ask a question to which you do not know the answer. Of course, I’m not real big on rules and I don’t really try to interview writers, per se. My general hope when I sit down with any one or, in this case, two writers is to get them talking about what’s important to them. Now, my soon to be proved foolish assumption was that both writers used the supernatural as a means to externalize internal states that are otherwise not easily described and that, in doing so, they set up supernatural worlds that abided by rules the authors themselves created. To a degree, this is the case for Lisa Desrochers, and she spoke eloquently of her efforts in creating a non-denominational supernatural architecture that included heaven, hell, angels and demons but eschewed religiosity and moralizing but not morality. Not an easy line to walk! Of course, my easy theory broke down completely when it came up against the complicated and intuitive writings of Karen Joy Fowler. For Fowler, the supernatural is by definition chaotic and intrusive; it’s bad things happening to anyone in its way for no good reason. It’s the breakdown of rules, not the introduction of new ones. To tell the truth, I thrive on moments when I’m proved wrong because, admittedly, that’s the majority of my life. But you can hear things go right as Karen Joy Fowler and Jill Desrochers talk about writing by following this link to the MP3 audio file. 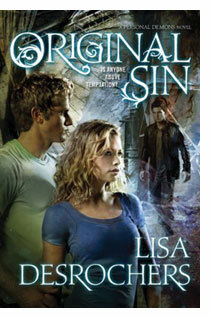 Rick Kleffel’s Review of Personal Demons and Original Sin by Lisa Derochers. Teen lit is a delicate balance. On one hand, you have to acknowledge all the salacious fantasies and thoughts that are going through young minds. They’re swimming in hormones and certain they know the world. Nobody can ever convince them otherwise. But they also need re-assurance, support, even love. They are easily bored. They are looking for the next big thing, or are certain that they have found it. Rarely, only rarely is it a book. Lisa Desrochers decided that she wanted to boil it down, and keep it simple. One girl, two boys. Oh, but the girl has some unusual abilities. And the boys have an otherworldly heritage. And like everyone, they all have personal demons. Some more personal than others. Desrochers is working on a trilogy, of course; the first installment is ‘Personal Demons,’ wherein we meet first Frannie, then the young man of her dreams, Luc (“Spell it with a ‘c’!”) Cain. Soon after that, we meet Luc’s counterpart, Gabe. Of course, these kids are just tad more complex and challenged than the average teen — but probably not so far as any teen reader is concerned. Both of the boys want to “tag” her soul. What makes or breaks books like these are the characters, and Desrochers, the mother of a teenage girl, writes characters who are complex and conflicted enough to seem real, even if they are all afflicted with the unreal. The story is told from the alternating perspectives of Frannie and Luc. Frannie is not a dreamy, indecisive beauty, but a down-to-earth girl who spends time under cars, working on them as well as in them, um … doing whatever it is that teenaged girls do in cars! Luc, a demon sent from hell to retrieve her soul, has existed for a long time, and taken many souls on this earth. But he’s not run into one such as Frannie. He’s not prepared for the depth of his own feelings, especially when Gabe shows up to avert Luc’s mission. Two boys, one girl—the math is simple, but the characters are not. While the novel runs on a love-triangle engine, the fantasy overlay of angels and demons is a cleverly-conceived theology that takes the whole story to a much more entertaining and enjoyable level. Desrochers is very smart, in that she keeps things strictly non-denominational. This book has no lectures and for a book about angels and demons, it’s happily bereft of religiosity. What we have in its place is a smart supernatural setup that plays out like a game of chess with moves, counter-moves, powers and counter-powers. Run this through some interesting and unpredictable characters and you get a reasonably page-turning tale of teenagers who might mean more than they bargained for. Between Frannie and Luc, there’s a lot of bargaining going on, and just between the two of them. They are both making deals with themselves, which prove to be more consequential than those they make with one another. Desrochers has just finished the follow-up, ‘Original Sin,’ which from the get-go spoils the plot of ‘Personal Demons.’ Suffice it to say that the ante is upped and that you’ll get access to another perspective in ‘Original Sin.’ Here’s a novel where things literally go south, and not for a sunny vacation. Of course, all of this is meant to play out to the admittedly vast audience of swooning gals who shelled out literally millions, probably verging on billions, of dollars for the latest vampire saga. That said, Desrochers knows the virtues of brevity. Instead of hulking tomes, we get compact novels. She also knows the virtues of humanity; instead of warring hunks, we have complicated souls, souls worth selling, which implies that souls have an intrinsic value. Even if they come with personal demons.